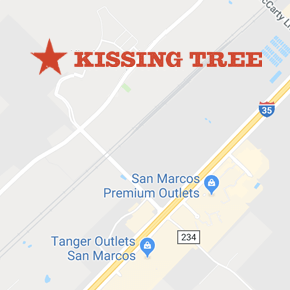 Residents of Kissing Tree live within close proximity of some of the most fascinating historical sites in the state of Texas. If you are a history buff, you will be thrilled to know that there are more than 16,000 historical markers across the Lone Star State. Indeed, every one of the state’s 254 counties has at least a few of these markers, which are managed by the Texas Historical Commission. Near San Marcos and across Texas Hill Country, military markers are especially abundant. The following historical markers are found in or near San Marcos and Texas Hill Country. The official name for each is provided, and you can find a map with directions to each one on the official website of the Texas Historical Commission. Jose Antonio Navarro Ranch – Located in Geronimo, which is in Guadalupe County, this marker marks the site of the ranch of Jose Antonio Navarro, who was one of the signers of the Texas Declaration of Independence. Navarro lived from 1795 to 1871, and he held positions in the Mexican government before becoming active in the movement for Texas independence. He acquired the land here in 1832; his family hid out in the ranch that he built while he was held captive by the Mexican militia from 1841 until 1845. Hardscramble – Located in Seguin, which is also in Guadalupe County, this marker was placed in honor of this historic structure. Over a period of about 30 years, the home was lived in by four of the most famous Texas Rangers in history: Henry and Ben McCulloch, Nathaniel Benton and Elijah V. Dale. All of these men were also veterans of the Texas Revolution. The ranger station is still located on the property, and tours are reportedly still conducted locally. Susanna Dickinson – This marker is located in Lockhart, which is in Caldwell County. It commemorates the woman who was nicknamed the Messenger of the Alamo. After surviving the Battle of the Alamo, she brought news of its capture to General Sam Houston. The marker is located approximately at the site of the home where Susanna lived with her husband, Almeron Dickinson. Vicinity of the Storming of Bexar – Located near the Alamo in San Antonio, this marker commemorates the first of four major battles of the war for Texas Independence. Forces successfully defended Bexar, as San Antonio was formerly called, ending a six-week siege. This particular event took place from December 5 to December 9, 1835. Anyone who is interested in the history of Texas independence, including the Battle of the Alamo, is sure to find this marker to be particularly interesting. Kerrville – Finally, there is a marker in the city of Kerrville, which is in Kerr County, that explains the history of both the county and the town. The county was established on January 26, 1856, and it was named in honor of James Kerr. Kerr was a pioneer and a soldier of the Republic of Texas. The city that also bears his name was incorporated on September 7, 1889. As noted on the marker, the county and city were originally called Kerrsville, but the S was dropped from the name shortly after incorporation.